On March 28th and 29th Sociabble will be at ExCeL, London, for the 2017 edition of the B2B Marketing Expo. Marylin Montoya, Director of Marketing and Partnerships, will speak at the event, presenting case studieson the companies leading the way in employee advocacy. Moreover, throughout the event attendees will have the opportunity to see live demos of Sociabble, the leading employee advocacy and social selling platform, find out about the EA Score: a new report that ranks the world’s leading companies on employee advocacy. Recent years have seen enterprises embrace the value of social media; and with it, the relevance of employee advocacy and social selling programs. In this presentation you will discover how companies such as BNP Paribas, PwC and Toshiba have scaled company-wide employee advocacy and social selling programs, as well as the impact these initiatives have had on employee engagement, enterprise communication and bottom-line business results. The session will also go into detail about the Employee Advocacy (EA) Score: a unique ranking that enables companies to measure the critical relationship between internal employee engagement and external brand visibility. EA Scores for the top 100 Fortune and FTSE companies, as well as those listed on the CAC 40 (EuroNext) index, have now been revealed. 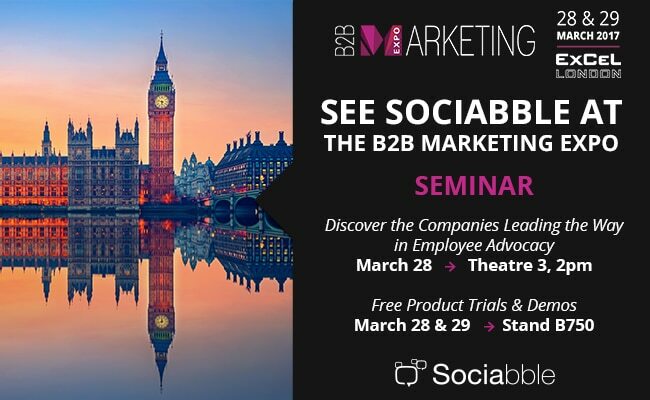 Additionally, attendees at the B2B Marketing Expo will have the opportunity to see live demos of Sociabble, the leading employee advocacy and social selling platform. Sociabble organizes brand, third-party, and user-generated content onto themed channels. From these channels users can share on social media; as well as utilize a full suite of gamification features, return-use mechanisms, and performance tracking metrics. Available natively for Android, iOS and Windows Phone; Sociabble also integrates with a number of CRM, curation, listening and retargeting tools, including Office 365 and RadiumOne. Used in over 60 countries, Sociabble has been deployed at scale by some of the world’s leading companies. Interested in employee advocacy but can’t make it to the event? Contact us or download our latest whitepaper, “Social Selling at Scale”.